When I met Little Red [alias], I knew right away she had been a victim of child abuse, somehow. I just have a sort of radar for that kind of thing. Little Red and I became close friends very quickly, but a couple years went by before she opened up to me completely. She finally told me one night that she had moved out of her mother's house and in with her father, because her mother's husband used to molest her when her mother wasn't home. Little Red used to fall asleep on the couch watching TV, and her step father would pick her up and carry her like a rag doll into the bedroom, lay her down, and begin molesting her. She pretended she was asleep, because she was afraid of what he would do to her if he realized she was awake. She finally told her mother, but her mother didn't believe her. And it didn't stop there. Little Red's own mother actually spread the word throughout their family and community that Little Red was making it up to get attention! This broke Little Red's heart and made it hard to trust people. I am fortunate and honored that she trusted me with her story, and that she's letting me be her voice for this cause. I knew before she told me that Little Red had been molested. And honestly, if it hadn't been for that, I'm not sure I would have believed her myself. But I do. And it's true. 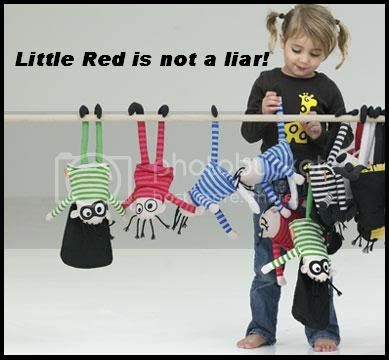 Little Red is not a liar. And for her mother to stab her in the back like that is wicked. And for 90 percent of the people they know to believe her mother over her, breaks my heart. Luckily, Little Red no longer lives with her mother and that monster, but few believe her still, and the perpetrator has still not been convicted. As for me, I will defend Little Red and her true story until the day I die.